It’s been a long haul but Logtown is now officially back on the map with the installation of new signs. To celebrate a ceremony was held Saturday that was attended by District 2 Supervisor Shiva Frentzen, Pat Dwyer, Logtown Fire Safe Council Chai; and Rod Repschlaeger, Logtown Fire Safe Council Vice Chair. 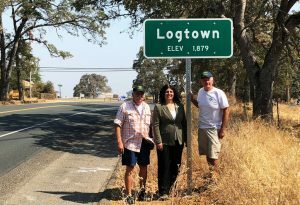 Dwyer, who was one of those leading the effort to have the signs reinstalled, said there have long been signs to mark Logtown’s location but when Cal Trans did some work on Highway 49, the signs disappeared. When asked to reinstall them, Steve Nelson, who is a district supervisor for Cal Trans, said he didn’t have Logtown on the map and couldn’t do so. Apparently the U.S. Geological Survey had inadvertently eliminated Logtown from their maps, retaining the area only as an historical site even though it was once a community of more than 800 people. Fortunately, two residents worked with the state and the USGS to put Logtown back on the map and also make it a census tract. According to Dwyer, that then gave Cal Trans the authority to recognize the community again and order the signs. The signs were erected at the end of July and now Logtown is officially on the Golden Chain Highway between Mud Springs and Pokerville. A part of the history of the gold rush in California and specifically El Dorado County, Logtown was at one time called Empire City as well as Logtown. A thriving community located three miles south of El Dorado, more than a dozen mines operated in Logtown Ravine at one time or another. Placer mining was also popular with scores of miners trying their luck on the banks of Logtown Creek. Eventually mining gave way to ranching and farming although during the Great Depression placer gold mining picked up again by those seeking a way to make a living. What remains now of Logtown is little more than what was there before the gold rush hit — hills covered in thick grass, groves of oak trees and cottonwoods and Logtown Creek along with a few more recently built homes and buildings. But thanks to Cal Trans District Supervisor Steve Nelson, District 3 Operations Manager Nick Beach and Supervisor District 3 Sign Crew Brad Snyder along with members of the Logtown Fire Safe Council, there are now signs to mark one more place that is a part of El Dorado County’s golden history.